Ok, so I have been reluctant to sign up for Gwynnie Bee. I know all of you mamas kept asking me if I had tried it, and I said I would--- but I really drug my feet on this one. Every time I went to the site, I just not find anything that was really "me." And by me, well most of you have seen enough of my photos to know that my wardrobe consists of gray, black, and khaki (and occasionally white). I am a fairly basic dresser, so to get something really colorful--- well, I was just sold on the idea. Then a friend got the service and her items were SO cute! Then someone pointed out that this was my way to dress colorfully once a week with no commitments-- I had a free trial and I will tell you I waited until the last SECOND to sign up (the free trial just ended, but I will be letting all my fans know when it comes back again). And ta-da! Three days later this beautiful dress arrived. Is it bright? Yes! But I wore it to church and received many compliments. For those that do not know about Gwynnie Bee, it is a subscription service where you receive clothing. Think Netflix for your closet. I am signed up for the 1 at a time service which is $35 a month (you can upgrade to two items at a time, or even three items at a time). They carry sizes 10-32 (yay!!!!). You fill your "closest" with items that you like, and they send you one of those items. It took 3 days for my item to arrive, and I am returning my item tomorrow morning (and I will come back next week to let everyone know how fast the return/ reship turn around was). They pay for shipping both to you and back. When you return the item, you get a new item sent to you. You can keep the item for as long or as short of a time as you would like. And in case you are wondering, YES they clean each and every garment before sending it out. In the end, I am really loving it. 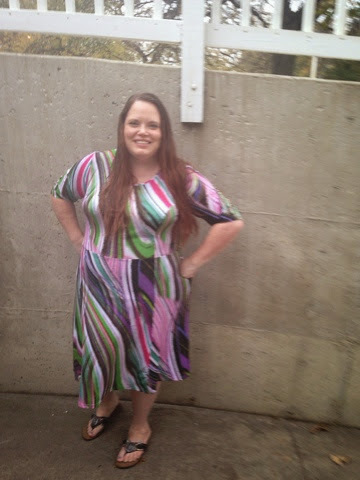 I would never have committed to buying a fun and colorful dress, but I loved wearing it just the one time! My husband is surprised I am even returning it, but that is part of the fun! AND if I want to put it back into my "closet" I can-- to get at a later time! This post contained referral links. MamaBreak may receive a bonus from purchases made through the above links. It does not impact your shopping experience. We only post about and recommend products we love. Thank you for supporting MamaBreak.